Band Graduation Cords could be referring to honor cords for a number of different achievements. Honor Cords can be worn by a high school band to show membership in the band, whether it be marching band or otherwise. The color and style of this honor cord is at the discretion of the students in the band or the band director / band teacher. The only rule in this case is that the color or style of graduation cord chosen does not match another group at the high school. The cords could be intertwined (braided) or solid (one color only), double or single. A second meaning of Band Graduation Cord is also at the high school level. It is a double pink honor cord to show membership in Tri-M. Tri-M,	Modern Music Masters or the TRI-M Music Honor Society, is a music honor society for high school and middle school musicians. Tri-M was founded in 1936 and is a program of the Music Educators National Conference (MENC), which changed its name to the National Association for Music Education (NAfME) in 2011. Tri-M honors students who achieve both academically and musically. One of their awards is to be able to wear the double pink graduation cord on graduation day with their cap, gown, and tassel. Tri M Music Honor Society is an international honor society and has over 5200 chapters. A third meaning of band honor cord could be one worn by a member of Pi Kappa Lambda, which is a National Music Honor Society at the College and University level. Pi Kappa Lambda Graduation Cords are a Gold and White Double Cord, which is created by tying together one gold cord and one white cord. Pi Kappa Lambda was founded in 1918 at Northwestern University	in Illinois. Since then the Honor Society has grown to over 250 chapters that are active right now and 64,500 members. 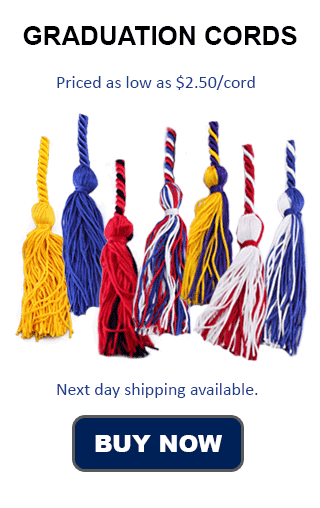 No matter what your purpose for ordering band graduation honor cords, whether it be for your high school band, or for an honors society, you are sure to be completely satisfied with the product and experience provided by Honors Graduation. And please remember to stop by our page for National Art Honor Society cords, and find some cords for your other artistic students!